Apex Legends is a battle royale game that excels in team-based strategy, offering eight unique characters with their own distinct looks and abilities. One of these characters is Lifeline, a support character that is arguably the best to start the game with due to the amount of utility and simplicity she has in her kit. As a support-based class, Lifeline’s main strengths come from her ability to keep your team in the fight by offering heals and shields. 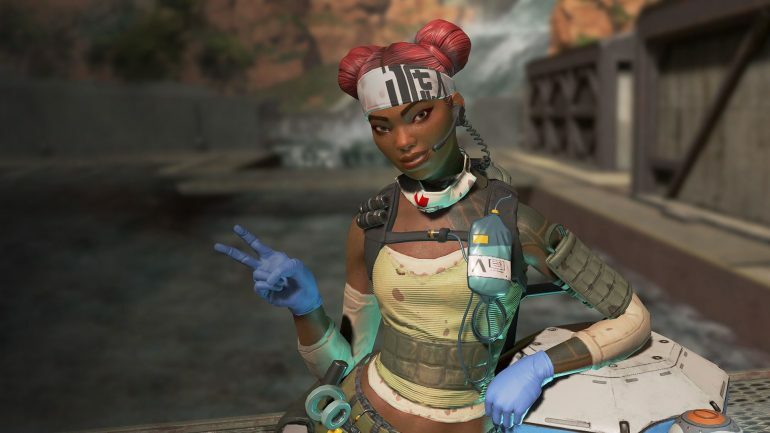 She is a character that everyone should try and have on their teams if they want a shot at getting that all important battle royale victory. With her passive ability, Lifeline creates a shield in front of a downed unit while reviving them to give you a better chance of saving an ally. This, combined with Gibralter’s Q shield ability, can really help you in a pinch to bring your squad back to full strength. Lifeline should always be the person reviving allies if and when able as well, as she slightly heals allies more than any other character on a successful revive. One of Lifeline’s main strengths comes from her Q ability, which drops a drone that slowly heals all members of the party surrounding it. The heal is slow, and not a lifesaver in a fight, but it definitely helps teammates save on other Health giving items that could be useful in later stages of a match. What we find helps as well, when you are in close quarters firefights, is to drop the Drone to give you a slow heal while firing at enemies. The drone is indestructible, so it can keep you healed while taking shots and could be the difference between life or death. Lifeline’s ultimate ability calls down a Care Package from the sky that brings your team— or whoever gets to it first— an assortment of high tier loot to give you that extra chance of winning the game. You’ll want to have your team pass you as many Ultimate Accelerant items that you find during your opening looting phase to try and get a care package dropped as quickly as possible. Thew later the game goes, the more useless your Ultimate becomes as the last thing you want to do in the last circle is drop a Care Package and give away your position. You could, however, use it to create some makeshift cover but it still defeats the whole purpose of what its used for— getting you high quality loot.